Little Dragons Cafe premise is you take the role of one of two siblings running a cafe with their mother. It is a peaceful little life from the start, until disaster strikes, and their mother comes down with a strange illness, leaving her in a coma like state. It is here that you find out that your mom is part dragon from a strange old man, and the only way to awaken her is to raise a dragon and turn your cafe into the most successful one in all of the land. So you do this through exploration and cafe management. 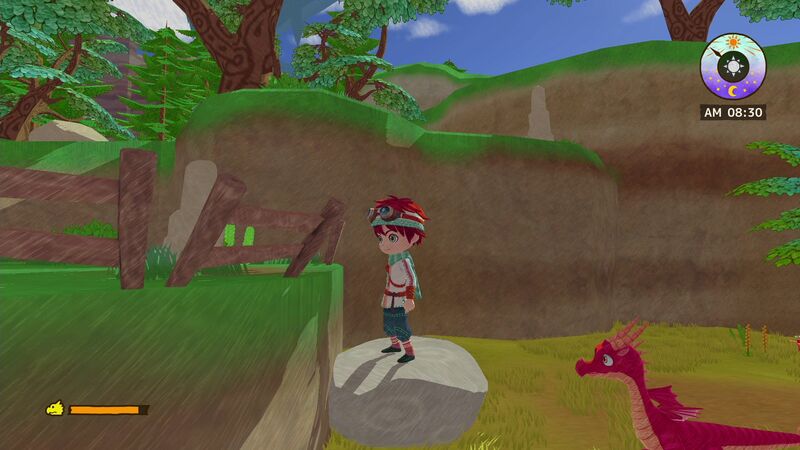 Little Dragons Cafe’s gameplay is very simple and straightforward. Which in turn makes it very relaxing and enjoyable when you want to unwind. The game is broken up into exploration and Cafe management. In the exploration part, you will go around the open world discovering new items and recipes to put on your cafe’s menu. The world will start off very small, from being able to explore the area around the cafe, to incredibly large as the story goes on and your Dragon grows. I like this idea because it makes the world feel like it is growing alongside of you. From when your dragon is just a hatchling, to the first time it takes flight, and allowing traversing the expanding world to become an adventure in it of its own. When exploring, see the Dragon as an extension of yourself, as it will have its own stamina meter as well. To keep the dragon happy, you have to feed it and pet it when it is feeling tired. I honestly really liked this relationship between the player and the dragon. The bond you form with the dragon can bring a smile to your face. While the resource gathering can feel real repetitive at times and begin to feel like a day by day chore, I always got a strange satisfaction for discovering new areas as they opened up to me. There would be times I would find an area that I had no clue that I was able to go to as early as I did. After exploring, you’ll need to take the resources you gathered and put them to good use. That is where the cafe management of this game comes into play. When you find recipes in the overworld you are able to cook them in your kitchen to add onto your menu. The cooking part of this game is honestly the best part. You cook dishes in a rhythm game. The better you perform, the better quality the dish is. As your chef cooks more of the same dishes, you are able to enhance dishes with better ingredients. This makes the rhythm part more challenging and lets you hear more of the catchy tunes. The only real complaint I have about the cafe part is how things work in the dining room. You are not required to stay around and babysit your staff while they take orders, serve, and do dishes. They are prone to slack of during work, and you will get a notification when they are slacking off while in the overworld. Early game this becomes rather annoying as you could be extremely far from the cafe. Thankfully, there is a single button that allows you to return to the cafe whenever you need to straighten out your staff members. At the same time I felt like the frequency of how much they slacked off made it harder to get much exploration done. While you don’t have to go and check on them, if you don’t your customers will leave dissatisfied and your end of the day rankings will suffer, causing your reputation to not grow. However, the only adverse effect I have seen from this is that you can’t progress the story if your reputation doesn’t increase and I have never seen it decrease yet. Now it kinda throws out any real risk since there is no monetary system in the game. Where Little Dragons Cafe shines the most would have to be the writing with the wonderful and colorful cast of characters. Each chapter takes a focus on a different guest that stays at your Inn. Through their time at the inn, you help them overcome any troubles or problems that they may have. This can range from a little boy who wants to be a warrior, to a witch who has lost her ability to cast magic to a runaway child, and other guests. Each one of these characters are very unique and I wanted to do all that I could to learn more about them. This also doesn’t account for the main cast either. You have a motley crew of employees who are running the cafe and despite most of them being incompetent, they do an amazing job at keeping you engaged. The writing is what kept me playing through Little Dragons Cafe. The gameplay is charming and very relaxing; but being able to help people out with their problems and learn more about this world was the real treat that I stayed for. While I wish there could have been more overall world building, I enjoyed every person I had a chance to befriend in this adventure. Maybe one day in a sequel, the game can be about running an inn in a bustling city as opposed to the outskirts of nowhere. The writing and character development in this game will always manage to warm your heart. This writing alone makes the grind through everything enjoyable and gives you a sense of purpose as you are going through. The story will also run you about 30-40 hours depending on how long you chose to take your progression. Each chapter clocks in at about one to two hours. Little Dragons Cafe has a story book aesthetic. Everything looks like it was drawn to be on the pages of a colorful book and the overworld is no different. The entire world is extremely colorful and a real treat to explore. However, there is a big difference between the PS4 version and the Nintendo Switch version. Performance on the PlayStation 4 is targeting about sixty frames per second, but while it does dip at times, it doesn’t really ruin anytime with it. On the Nintendo Switch, however, the framerate targets thirty frames per second, and suffers from much more frequent frame rate drops, and some weird animations. While this is less of a problem when docked, it still can be jarring at times. 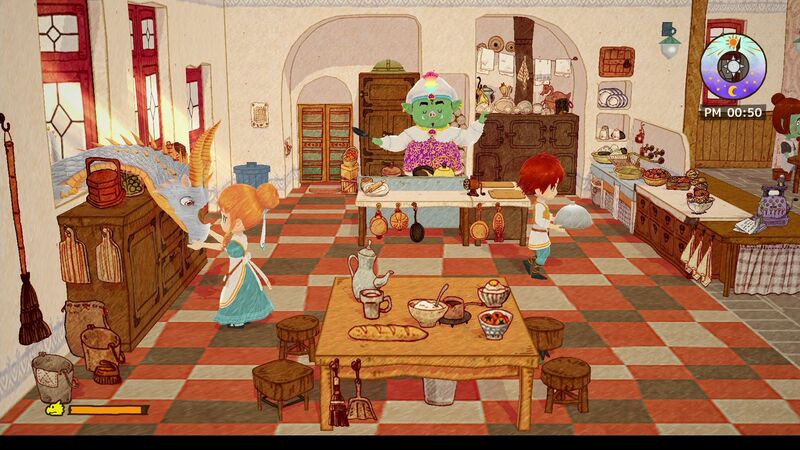 For the kind of game Little Dragons Cafe is you may find yourself getting use to it. At this point, which version you get will boil down to what your personal preference may be. Another quick issue is that on the Switch version load times are much longer and they are also frequent on the PS4 version. Pop in is also quite prevalent in both versions, again with the Switch version being the worst offender, but I never found them to be off putting. Finally with presentation, I wanted to take a moment to talk about the game’s music. The music sounds like it is straight out of a Story of Seasons entry and gives me fond memories of say A Wonderful Life. The music for each area of the map that you explore is very relaxing and helps tie together the entire package. The only downside is that there isn’t any night time music, so after 6pm the music will shut off and you will be stuck with ambient night sounds. Finally, the music for the cooking portion is so catchy that I am always trying to make the most complicated dishes possible so I can listen to the songs in their full length. 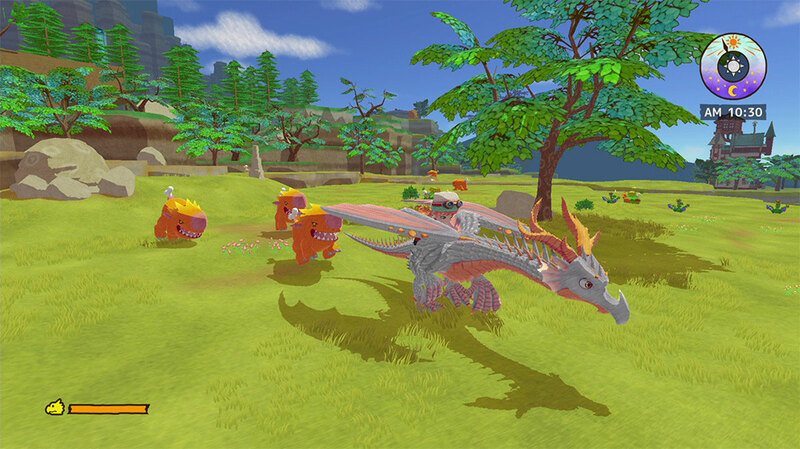 Little Dragons Cafe is honestly a return to form for Yasuhiro Wada. He has managed to create a game that manages to recreate the magic he did when working on the Story of Seasons series. 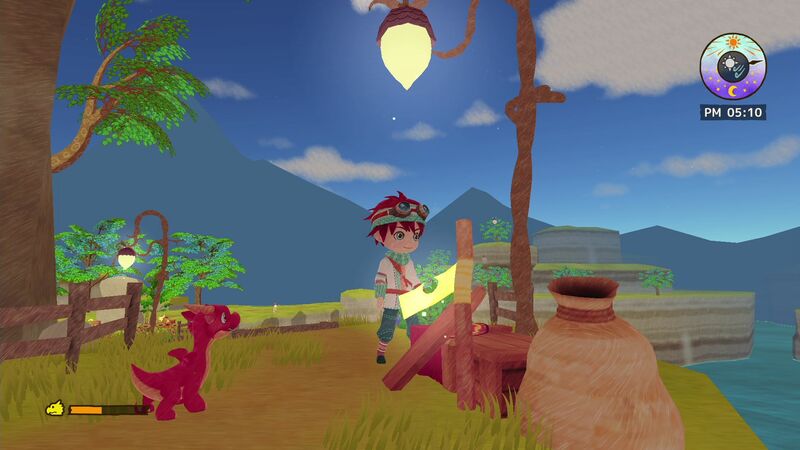 This game may not be for everyone, but if you are interested in a game that will truly warm your heart and help you unwind after a busy day, Little Dragons Cafe is the game for you. All it really boils down to is your preference when it comes to performance. I am excited to see if Little Dragons Cafe will become Wada-sans next Story of Seasons. Posted on August 23, 2018, in Reviews. Bookmark the permalink. 1 Comment.